Starting from Windows Server 2008, it is possible to define different password and account lockout policies for different sets of users within the same Active Directory domain. Previously only one password and account lockout policy (the Default Domain Policy) could be applied to all users in a domain. That caused a lot of problems and organizations had to either use third party password filters or implement multiple Active Directory domains for different types of users. 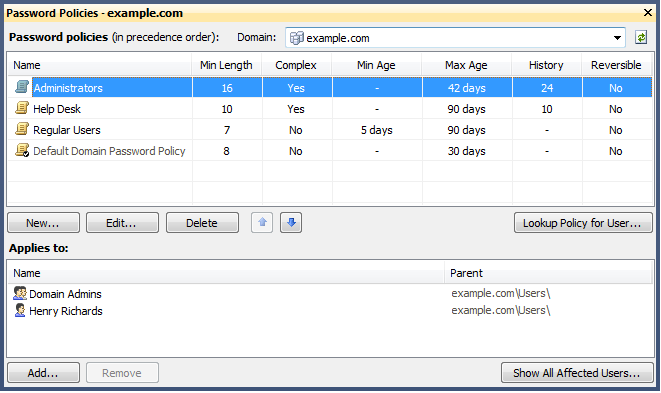 Fine-Grained Password Policies give you the ability to define multiple password and account lockout policies within a domain. This allows you to apply different levels of security to different users depending on their role in your company. For example, you can apply strict policies to administrators and help desk personnel, and less severe policies to other users. Adaxes gives you the ability to configure and manage fine-grained password policies using a very user-friendly and intuitive user interface. For more details, see Manage Fine-Grained Password Policies. With Adaxes you can quickly view and edit the password policy applied to a particular user. When creating new users, editing user properties, changing or resetting passwords, you can click the View Password Policy link to view and edit the password policy applied to the user. 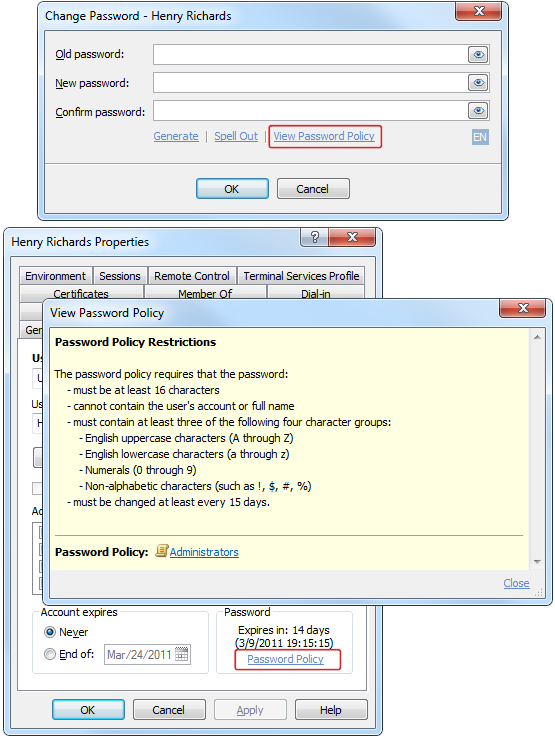 The View Password Policy dialog displays password restrictions enforced by the Default Domain Password Policy, Fine-Grained Password Policies, and third-party password filter software, like Anixis PPE. To learn more on how Adaxes can improve, automate and streamline the process of Active Directory management, see Adaxes features, and Adaxes tutorials.